The first trowel design ever made in the DeWit factory. With this basic trowel we have explored the first gardens. With the great feedbak from the global gardeners we created more tools. The unique basic details of this model makes it to great quality tools. And the basics from the beginning are still in all the tools we are making. The original design is great for working in sandy soil. The traditional design of this trowel is stronger then the Original design, because it’s a forged connection between handgrip and blade. The X-treme connection is forged and because of that it’s stronger and more durable. We have made many products with this connection and it’s really perfect for working in normal ground. A trowel that cannot be ruined by anything. The creation of a not bending, not breaking and never let you down gardentool. It’s the ‘Welldone’ trowel. Designed by DeWit® and strong as a buffel. Made from the best material and made by the best makers of gardentools. The modern design is great for working in hard soil and for the devastating gardener. DeWit® Garden tools - Handles The best Garden tools in the world needs the best handles. All our handles are made out of ash and provided with our oval DeWit® logo. Comfortable, always painted and really smooth. Our handtools are provided with an ash handgrip, ash P-grip or an ash drop-grip handle. These different handles are shown below. Standard we use this 140mm ash handgrip. This handgrip is really comfortable and really strong. Always provided with our oval logo, always painted and comfortable to use because it’s really smooth. This handle is 140mm long, we also have a version of 100mm long. Optinal we have an short (35cm) handle with an hilt. It is possible to use small handtools with two hands. Made for gardeners who are suffering Artritis. They don’t have to give up gardening. This ash P-grip is the perfect solution, so you can still fullfill your dreams in the garden. Where desirable can selected for an drop-grip handle. This handle is almost 50cm long and is really great for using in combination with a cultivator, planting trowel, handfork etc. Because of the long length you can work in hard to reaching places. The handle is made out of ash. Created from the best steel and by the best craftsman in the world. The steel is forged and hardened and the original DeWit® finishing makes it to a perfect help in your garden. The handgrip is made from ash wood. Unique on this DeWit® trowel is the cutting edge, it’s sharp as a razor blade from the top till the end. A trowel that cannot be ruined by anything. The creation of a not bending, not breaking and never let you down gardentool. It is the ‘welldone’ trowel. Designed by DeWit®, strong as a buffel. Made from the best material, and made by the best makers of gardentools. The first trowel design ever made in the DeWit factory. With this basic trowel we have explored the first gardens. With the great feedbak from the global gardeners we created more tools. The unique basic details of this model makes it to great quality tools and the basics from the beginning are still in all the tools we are making. The cutting edge is very sharp, the handle is made from ash. A trowel that cannot be ruined by anything with a feature; the serrated cutting edge. The blade on it’s own is already sharp as a razorblade. With the serrated blade you have even more benefits to cut trough roots and the heavy soil. The creation of a not bending, not breaking and never let you down gardentool. It is the ‘Welldone’ trowel. Designed by DeWit®, strong as a buffel. We added a bottle opener to our planting trowel. The trowel is made from high quality steel, and not only made for work with in the garden. Have a cool drink and when a bottle needs to be opened, with this trowel it is easy. A nice gift for his or her birthday. For transplanting you don’t want to dig large but most of the transplanting needs narrow blades. This blade is very sharp from top till bottom and the finishing is done in original DeWit® finish. The transplant trowel has an ash handgrip. The transplant trowel has a narrow blade compare to a regular trowel. For transplanting you don’t want to dig large but most of the transplanting needs narrow blades. The blade is very sharp from top till bottom and the finishing is done in original DeWit® finish. The trowel has an ash handgrip. The shape of the blade is made after oldstyle Victorian design. And it’s more than a design, the shape makes it to a nice planthole digger. The blade starts small en by going deeper in the soil the blade is getting wider, so less resistance in the beginning of digging the holes. The cuttingedge is very sharp, and the handgrip is made from ash. Finished in the original DeWit® style. Designed for the Chelsea Flower show. We needed a touch of the Dutch and that’s is how the tulip trowel was created. It is more than just a shape. The curved shape of the blade makes in combination with the great cutting edge a nice round planthole. The edge are sharpened like a razorblade, this trowel digs trough any kind of soil. Finished in original DeWit® design with an ash handgrip. Planting in tiny places and hard soil types can be done excellent with this rockery trowel. The blade is 30mm wide, made of Boron steel and it comes with an 140mm ash handgrip. The basic potting trowel is made to fill flowerpots and containers easily. The round curved blades makes also nice plantholes. The very sharp cutting edge cuts trough the soil easy. It’s from the basic line, the first gardening handtools with the original DeWit® design finishing. In the same line you can see a trowel, fork and transplant trowel too. This trowel with it’s narrow but long blade is made to dig out taproot weeds. Taproot weeds have long deep roots that have to be dig out completely to get rid of them. This trowel allows to dig around the root and with the long blade you’re getting also deep enough to remove the complete weed. Made from Boron steel and finished in the original DeWit® design. This DeWit® trowel has a blade that’s made with the V-cut edge. It’s gives you extra benefits by digging, dividing and planting in rooted areas in the Border. The edge is sharp like a razor blade and cuts easily trough roots and hard soil like clay. The cutting edge of a trowel makes the difference. Once you felt the difference between a trowel and a DeWit® made trowel you know why you want it. Made in Holland from the best Swedish Boron steel and comes with an ash handgrip. Sustainable made, durable and guaranteed a lifetime. This DeWit® trowel has a regular blade that’s made with the V-cut edge. It’s gives you extra benefits by digging, dividing and planting in rooted areas in the Border. The edge is sharp like a razor blade and cuts easily trough roots and hard soil like clay. The cutting edge of a trowel makes the difference. Once you felt the difference between a trowel and a DeWit® made trowel you know why you want it. Made in Holland from the best Swedish Boron steel and comes with an ash handgrip. Sustainable made, durable and guaranteed a lifetime. We’ve designed this trowel after we worked a few days with most of our trowels. It’s not always needed to use the pointed shape of a trowel, sometimes you just want to dig a hole with a flat bottom. The straight cutting edge does the job. The edge is sharp like a razor blade and helps you digging where you want. This trowel is made in our called ‘Welldone’ line, so it is part of the strongest trowel line in the entire world. A real tool that is made for using it. DeWit® Serrated scoop is suitable for filling the flower boxes. The serrated cutting edge is made for creating larger planting holes into the ground. The pointed blade can be used to create rows into the vegatable garden for seeding. The strong trowel with razorsharp blade and a big oval handgrip for gardeners with large hands. The blade is made from Boron steel, and with the large ash handgrip it digs like a shovel. Bigger blade, bigger handle a tool for the job. This trowel digs holes like a shovel. Made from strong steel, sharpened from top till bottom, ready and build for using. The large blade is perfect for ‘in between’ jobs in the garden. If it is too big for a regular trowel and just not big enough to do it with the shovel, this is the tool you want. We call it a trowel but it digs like a handshovel. The strong oval handgrip is made of ash wood. Some of us can only use the heavy duty products. This very strong Tulip shaped trowel has a bit of everything. It’s high quality, it’s big and it has a very sharp cutting edge. Works like a handshovel. Unique is the extra large oval handgrips that are made of ash. A forged trowel, forged by hand and excists out of one piece of Boron steel. Perfect for loosening soil and for digging small plantholes. It also a very good help for planting and weeding. This scoop is a remake from an old Colescoop. We’ve made it extra strong so it can be used to fill your larger pots and containers with soil, but if you need to dig a hole you can use it too. The cutting edge is sharp and the blade has the original DeWit® finishing. We are also making a version with a 40cm and a 80cm handle. This gardenscoop comes with an 400mm ash T-handle. Containers, Flower boxes and borders can be filled easy with this scoop. But what about planting Shrubs, Buxus or Conifer. That’s an easy job with this gardenscoop. The gardenscoop comes with an 800mm ash T-handle. The perfect scoop for digging big planting holes. With the long handle you can do your planting work while you are standing, sometimes you just don’t want to sit on you knees. The round blade is also much easier to dig out planting holes, because there will remain much more ground on the blade. Created from the best steel and by the best craftsman in the world. The steel is forged and hardened and the original DeWit finishing makes it to a perfect help in your garden. The 48cm drop grip handle is made from ash wood. The longer handle makes working in raised beds and leveled borders easier. Unique on this DeWit® trowel is the cutting edge, it’s sharp as a razorblade from the top till the end. This DeWit® trowel has a regular blade that’s made with the V-cut edge. It’s give you extra benefits by digging, dividing and planting in rooted areas in the border. The edge is sharp like a razor blade and cuts easily trough roots and hard soil like clay. The cutting edge of a trowel makes the difference, Once you felt the difference between a trowel and a DeWit® made trowel you know why you want it. Made in Holland from the best Swedish Boron steel and comes with an ash handgrip. Sustainable made, durable and guaranteed a lifetime. We’ve designed this trowel for ergonomic reason, by cutting parts of the blade it’s less weight and still a heavy duty tool for your garden. During our research we’ve learned that it’s a great tool to mix your soil in the border with fertilizer when you are planting. If you are planting in dry soil it’s also great to mix water trough the soil so you make the best place to put your plants. Made from Boron steel and it comes with an ash drop grip handle. Created from the best steel and by the best craftsman in the world. The steel is forged and hardened and the original DeWit finishing makes it to a perfect help in your garden. Unique on this DeWit® trowel is the cutting edge, it’s sharp as a razorblade from the top till the end. The P-handle is designed for people who are suffering Arthritus. You don’t have to give up gardening, with the P-handle tools you can use both hands. The weeding fork can be used to pull out taproot weeds, but also for weeding daisy and dandelion. By pushing the tines in the soil near the weed the fork can be pushed back and the soil is loosening and opening, the weed can just taken out. With this fork you can break the soil and also remove the soil from roots of old plants that you want to remove. Comes with an 140mm ash handgrip. The steel is forged and hardened and the original DeWit® finishing makes it to a perfect help in your garden. The handgrip is made from ash wood. With this fork you can break the soil and also remove to soil from roots of old plants that you want to remove. A fork that is real strong. Doesn’t look as strong in the first. But once you’ve tried it, you will feel the difference. It’s just a handfork, small in size but big in results. The creation of a not bending, not breaking and never let you down gardentool. It is the ‘Welldone’ fork. Designed and made by DeWit®. This smaller handfork is made in combination with the small version of our trowel. To work in smaller area’s, pots and containers. The blade is just a bit smaller, less weight and it feels comfortable to work with. The handgrip is our basic handgrip, made from ash. This handfork can be used as a small rake. The tines are bended which is easier if you want to pull or leverage the mulch in your border. It’s made from the best Swedish Boron steel and it comes with an ash handgrip. It’s also available with the drop grip- and long handle. Twisting the tines of a fork comes from centuries ago. Those days they used this technic to bring more strength in the product. Today we have the opportunities to do it again, but on a better way and with stronger material that created new benefits. The tines have a tapered ship which makes the much easier to work with. It’s an easy tool to dig trough your soil, to mix topsoil and dirt in your border and it’s a great plant removal tool too. The strong ‘Welldone’ connection is the thoughest connection ever. This large handfork is made for the bigger jobs in the garden. A handfork can be used to loosening the soil around the roots of a plant. It’s also nice to use to remove old plants and annuals from the border. With a fork you just dig out the plant or annuals and leave most of the soil in the border. Made with a large oval handgrip, this tool is made to use. Twisting the tines of a fork comes from centuries ago. Those days they used this technic to bring more strength in the product. Today we have the opportunities to do it again but on a better way and with stronger material that created new benefits. The tines have a tapered ship which makes it much easier to work with. It’s an easy tool to dig trough your soil, to mix topsoil and dirt in your border and it’s a great plant removal tool too. The strong ‘Welldone’ connection is the thoughest connection ever. With this fork you can break the soil and also remove to soil from roots of old plants that you want to remove. With the 48cm long drop grip handle you can reach more places in the border and raised beds. With this fork you can break the soil an also remove the soil from the roots of old plants that you want to remove. The P-handle is designed for people who are suffering Arthritus. You don’t have to give up gardening, with the P-handle tools you can use both hands. This handfork can be used as a small rake. The tines are bended which is easier if you want to pull or leverage the mulch in your border. It’s made from the best Swedish Boron steel and it comes with the 1400mm long ash handle. It’s also available with the drop grip- and regular handgrip. Sometimes you need to cut a branch, roses that you just cannot reach because it’s to high or your arm is too short. This easy branch hook is the helping hand in your garden. Just pull it towards you and cut the branch. It’s also a great helper to guide your plants over the patio. For the bigger bulbs we have this 50mm conical shaped bulbplanter. The turned edges are protecting your shoes if you need to use extra power with your feet. This bulbplanter comes with an 40cm ash handle with T-grip so you can use both hands to put more power on it. For the bigger bulbs we have this 50mm conical shaped bulbplanter. The turned edges are protecting your shoes if you need to use extra power with your feet. This bulbplanter comes with an 80cm ash T-handle, so you can use it while you are standing and this will safe your back. We call it a bulbplanter but it’s really good to plant loads of perennials and annuals. It doesn’t take a lot of skills to plant 300 pieces per hour. A nice way to create holes for plants and bulbs by standing up with a straight back. It’s made of the blades of two plantingtrowels that dig a hole together. The hinge between the blades can be used as a step to push the blades in the soil. Once you have the blades in the dirt deep enough you close the hinge and pull it up. You digged the hole. For a good demonstration take a look at our YouTube channel: DeWit Garden Tools. The Tulip Bulbplanter is made with an 80cm long T-handle made out of ash. As an extra we have created a ‘step’ so you can use your foot to push the planter into the dirt. Find the position in the border where you want to plant your bulb, place the planter and push it into the soil, when needed with some extra pressure to put your foot on the steps. After you have created the hole, you place the bulb in the hole and bring to dirt back into the hole. Our wooden dibber is made with a brass point. Easy for making small plantholes for your seedlings. It can be used in the border, veggy garden and ofcourse great to use in your greenhouse. The messuring is to help you to plant with the right depth. If you need to create a lot of planting holes and you need more power, then this dibber with metal point could be the solution. With the T-grip at the top of the handle you have the possibility to work with both hands. When you are working with two hands you need less effort to finish the job. This weedknife is made to remove weeds, moss, grass from between blockpaving, slabs or wallpaving. The blade of the knife is hardened and has the original DeWit® finishing. Made with comfortable ash handgrip. This weedknife is made to remove weeds, moss, grass from between blockpaving, slabs or wallpaving. The blade of the knife is hardened and has the original DeWit® finishing. Made with comfortable 400mm ash handle to save your back. This weeded has three different angles that fit in between paved areas. When weed comes between concrete tiles it’s hard to get them out. With the triangle head there is always an angle that scrapes the weeds out. Also availble with a longer handle. This weeded has three different angles that fit in between paved areas. When weed comes between concrete tiles it’s hard to get them out. With the triangle head there is always an angle that scrapes the weeds out. Made with comfortable ash 1400mm handle to save your back. Made for the heavy duty jobs. Large thistles in the lawn needs large weeders. This tool has to be pushed into the soil or lawn straight near the roots of the thistle. Once the tubular part has reached the surface you pull the handle towards your self and bring it down to the surface. The tube works as a leveler by pulling the handle back the weed pops out. Made with an 48cm ash drip grip handle for extra comfort. Made for the heavy duty jobs. Large thistles in the lawn needs large weeders. This tool has to be pushed into the soil or lawn straight near the roots of the thistle. Once the tubular part has reached the surface you pull the handle towards your self and bring it down to the surface. The tube works as a leveler by pulling the handle back the weed pops out. Made with an 800mm ash T-handle. This 3 tine cultivator is made for quick aerating and cultivating jobs in hard to reach places. The handgrip is made of ash wood. The tines are special curved so you do not disturb to soil to much. This cultivator is designed after the human hand. The 5 tines are shaping like ‘raking’ fingers in the garden. The narrow space between the tines gives the benefits of finetuning the borders. By cultivating the borders you create more grow potential for flowers and plants. The tines of this spring tine cultivator are made out of spring steel. Most of the time gardeners are using this cultivator to clean up the garden after cutting Buxus or other hedges. With the spring tines you can also rake the waste out of the buxus or hedge. For the full borders we’ve created the handclaw. The tines of this tool are short and are not going deep into the ground. The round tines are suitable to remove heavy weeds out of the ground. Bio cultivator for aerating and cultivating small spots in your border or container. The Spike weeder is a combination of a rake and a cultivator. Instead of only working from front till back with a cultivator the spike weeder can used in a circle, you can move it to any direction you want. Because of the narrow tines it’s loosening soil pretty easy. This tool is not made to use in clay soil! Sometimes the soil is really in bad shape and you need to aerate just a bit deeper than a regular cultivator does. With this 1 tine (Sauzahn) cultivator you can go deeper without disturbing the dirt too much. The forged narrow blade is great to use in vegetable gardens. This tools is also availble with a long handle. Original from Germany to use it in hand soil of the vegatable garden. The heavy duty single tine cultivator breaks the soil and aerates very deep. This large cultivator is build to use. Heavy duty, strong durable and with a large oval ash handgrip. The tines are strong enough to cultivate in heavy duty circumstances. This 3 tine cultivator is made for quick aerating and cultivating jobs in hard to reach places. The tines are special curved so you do not disturb to soil too much. In combination with the medium length drop grip handle this tools is a favourite tool for every gardener. The Spike weeder is a combination of a rake and a cultivator. Instead of only working from front till back with a cultivator, the spike weeder can used in a circle. You can move it to any direction you want. Because of the narrow tines it’s loosening soil pretty easy. This tool is not made to use in clay soil! With the 48cm drop grip handle you can reach more areas in your border. This 3 tine cultivator is made for quick aerating and cultivating jobs in hard to reach places. The tines are special curved so you do not disturb to soil too much. The P-handle is designed for people who are suffering Arthritus. You don’t have to give up gardening, with the P-handle tools you can use both hands! This 3 tine cultivator is made for quick aerating and cultivating jobs in hard to reach places. The ultimate way to cultivate your border. The long handle is a real backsaver. The 5 tines are narrow to eachother and besides aerating the soil, they are also breaking the soil in your border. The long handle is a real backsaver. Basic cultivator for working in your garden. The longer handle saves your back. This fork is easy to work with if you are removing old plants or annuals. The tines are helpfull to get the soil from the roots. Sometimes a trowel is too small and a shovel is too large. This handspade is the one you need for the jobs in between. Handspade to work in smaller areas in your garden. Ideal to use for the average planting jobs. The perennial planter has a heartshaped blade that is great to devide and replant your perennials. The plantspade has a pointed blade that is great to devide and replant your perennials. After old New England traditional design, the Cape cod weeder. The blade is small and tapered. By pushing the blade underneath the surface and pulling it back you are loosening the roots of the weeds. When the roots are loosen it is easier to remove to complete weed of your border or container. This one is for lefthanded gardeners, a righthanded is availble too. The Japanese version of a hand weeder. The blade goes underneath the surface to slice through the roots of the weeds. This version of the Japanese handhoe is for left handed gardeners. This is the right handed version of the Japanese weeder. Great for weeding and clearing borders. The strong blade works as a knife trought the dirt. Made form one piece of steel and comes with a sharpened blade. The handle is made from ash. This version of the Japanese handhoe is for right handed gardeners. This Korean style of a hoe, also called the hoe-mi, can be used on both sides to weed and cultivate. This version of the Korean handhoe is left handed. This Korean style of a hoe, also called the hoe-mi, can be used on both sides to weed and cultivate. This version of the Korean handhoe is right handed. The roots of the Daisy can be easy lift up in the lawn. After lifting the root you can grap the weeds with your hand and remove them from the lawn. The Bio Daisy grubber has a flat blade and a very sharp cultivator edge. The roots of the Daisy can be easy lift up in the lawn. After lifting the root you can grap the weeds with your hand and remove them from the lawn. The Weedpopper is made for weeds like the Daisy in your lawn. Pushing the two tines straight into the soil near the weeds, bring the handle back and the weed pops up. The weeder works very good for several weeds in your lawn. It’s a real lawnweeder. Sometimes you just want to loosen your soil, or remove a single weed. The weedfinger does it all. With the twisted tines, the rake has less resistance and slides through the soil much easier. With the twisted tines, the rake has less resistance and slides through the soil much easier. Comes with an ash drop-grip handle. This small handrake is ideal to loosening soil in small gardens, borders and raised beds. In between vegatables you can loose the soil without disturbing the roots of the plants. The small tines are really aerating the dirt were you need it. The rake is forged from Boron steel and the comfortable handgrip is made from ash wood. This handrake is ideal to loosening soil in small gardens, borders and raised beds. In between vegatables you can loose the soil without disturbing the roots of the plants. The small tines are really aerating the dirt were you need it. The rake is forged from Boron steel and the comfortable handgrip is made from ash wood. The gardendisc is a multifunctional tool in your garden. Designed for the gardener who wants a little of everything. You can weed the border by pushing and pulling, turn it on the side and the blade will cut the edge of your lawn too. The most creative gardener can use the blade as well to dig a planting hole in the dirt. Made for the citygardener. Ideal handhoe for weeding between small plants. By pushing and pulling this handhoe the soil wil get loose and this results in a better soil structure. The Dutch are used to push and pull their weeder. This heartshaped handweeder is also used for weeding borders and raised beds. You place the blade on the dirt in the border with a small angle so the blade is pushed below the surface. By pushing it from you and pulling it towards you the dirt is loosen and the roots of the weeds are cutted. Because of the roots that have been cut the weed will not grow anymore and the energy goes straight to your plants again. The gardendisc is a multifunctional tool in your garden. Designed for the gardener who wants a little of everything. You can weed the border by pushing and pulling, turn it on the side and the blade will cut the edge of your lawn too. The most creative gardener can use the blade as well to dig a planting hole in the dirt. Made for the citygardener. Comes with an 1400mm ash handle to save your back. The Dutch are used to push and pull their weeder. This heartshaped hoe is also used for weeding borders and raised beds. You place the blade on the dirt in the border with a small angle so the blade is pushed below the surface. By pushing it from you and pulling it towards you the dirt is loosen and the roots of the weeds are cutted. Because of the roots that have been cut the weed will not grow anymore and the energy goes straight to your plants again. The Dutch are used to push and pull their weeder. This round hoe is also used for weeding borders and raised beds. You place the blade on the dirt in the border with a small angle so the blade is pushed below the surface. By pushing it from you and pulling it towards you the dirt is loosen and the roots of the weeds are cutted. Because of the roots that have been cut the weed will not grow anymore and the energy goes straight to your plants again. The original style Dutch hoe, hoes that the Dutch are weeding while pushing the weeder instead of pulling it. Made from a single piece of Boron steel. The best way to discover DeWit® quality gardentools. Bio weeder for aerating and cultivating small spots in your border or container. The perfect tool to get weeds out of your lawn. The bended blade pulls the weed out. Easy lightweight handrake to clean up your border or raised bed. Easy lightweight handrake to clean up your border or raised bed. Comes with a 1400mm long handle to save your back. Small in size but strong in quality. Working in the greenhouse, container, flowerpot. This trowel does the job for you. A high quality tool for gardening in small areas like territoriums, balcony and in the greenhouse. Made by hand from high quality Boron steel. This tiny fork is made to lift your seedlings from the seedtray to the pot where it will grow to a plant. Works in combination with the greenhouse knife. Great for scraping or removing moss from your container or flower pots. Together with the fork the tool to transplant your seedlings. The knife is loosening the roots while the fork lifts the seedlings. This Greenhouse set of 4 pieces in wooden box is a perfect gift for the gardener who loves to work in the greenhouse. This set includes the DeWit® Greenhouse fork 2 prong, DeWit® Greenhouse knife, DeWit® Greenhouse scraper and the DeWit® Greenhouse trowel. Packed all together in the wooden box. This Greenhouse set of 4 pieces on tool rack is also a perfect gift for the gardener who loves to work in the greenhouse. This set includes the DeWit® Greenhouse fork 2 prong, DeWit® Greenhouse knife, DeWit® Greenhouse scraper and the DeWit® Greenhouse trowel. Comes with a tool rack for hanging against the wall. With this line of Weed Warrior tools we have created a high quality range of products. This comby hoe #1 is made to dig in hard soil. By hoeing in the soil you are able to break it. The strong durable blade is good enough to dig up roots. The narrow tines on the top can be used as soil breaker and to smoothen the surface. Also available with a longer handle. Strong, durable and build to use. With the #2 you’re able to dig up the roots of the weeds for a complete removal. With the strong tines you are loosen the soil, so you are able to pull the weeds out very easy. Also available with a longer handle. The #3 in the line of Weed Warriors comes with a blade for digging and a three tine head for cultivating. Also available with a longer handle. The #4 in this line is a hoe to break soil before you can plant. It’s a great to clean the borders from weeds before the new season starts. Remove old weeds, break the soil and prepare it for new plants to grow. Also available with a longer handle. This #5 of the Weed Warrior line has a two tine head made out of Boron steel. Like all the tools in this line the heads are hardened to give you a tool to use. With this tool you can break the soil before planting and to loosen the soil to get your weeds out. Also available with a longer handle. This #6 of the Weed Warrior line has a two tine head made out of Boron steel and a hoe to break soil before you can plant. Like all the tools in this line the heads are hardened to give you a tool to use. This Combyhoe is the #4 and #5 in one. Also available with a longer handle. With this double hoe heartshaped you can loosen solid soil in your garden. Loose soil is important for your plants to grow, because they will get more energy to grow. Available with a short handle to work on your knees and longer handles to safe your back. With this double hoe straight you can loosen solid soil in your garden. Loose soil is important for your plants to grow, because they will get more energy to grow. Available with a short handle to work on your knees and longer handles to safe your back. With this Canterbury round eye hoe you can loosen solid soil in your garden. Loose soil is important for your plants to grow, because they will get more energy to grow. Available with a short handle to work on your knees and longer handles to safe your back. With this Chelsea round eye hoe you can loosen solid soil in your garden. Loose soil is important for your plants to grow, because they will get more energy to grow. Available with a short handle to work on your knees and longer handles to safe your back. With this Oxford round eye hoe you can loosen solid soil in your garden. Loose soil is important for your plants to grow, because they will get more energy to grow. Available with a short handle to work on your knees and longer handles to safe your back. Perfect help for loosening soil. Comes with an 1300mm ash handle. This is a very narrow heartshaped handhoe for weeding in small rows. The small blade is pushed below surface and pulled towards yourself. The soil is loosening and the roots of the weeds are cutted. The weeds is not growing anymore and your plant have more energy to grow and bloom. Made with an ash grip. This is a very narrow straight handhoe for weeding in small rows. The small blade is pushed below surface and pulled towards yourself. The soil is loosening and the roots of the weeds are cutted. The weeds is not growing anymore and your plant have more energy to grow and bloom. Made with an ash grip. This traditional Dutch handhoe is used for weeding and loosening soil in your border, raised beds and containers. You bring the weeder from you and place it on the soil, by pulling the weeder towards yourself the blade goes below surface and cuts through the soil. By moving the blade from and towards you the roots of the weeds are also cut from the dirt. Once the roots of the weeds are cutted they wil stop growing. This traditional Dutch handhoe is used for weeding and loosening soil in your border, raised beds and containers. You bring the weeder from you and place it on the soil, by pulling the weeder towards yourself the blade goes below surface and cuts through the soil. By moving the blade from and towards you the roots of the weeds are also cut from the dirt. Once the roots of the weeds are cutted they wil stop growing. This version is for left handed gardeners. This onion hoe is created for weeding and loosing the soil in the border, raised beds and containers. Comes with an 140mm ash handgrip. This traditional Dutch handhoe is used for weeding and loosening soil in your border, raised beds and containers. You bring the weeder from you and place it on the soil, by pulling the weeder towards yourself the blade goes below surface and cuts through the soil. By moving the blade from and towards you the roots of the weeds are also cut from the dirt. Once the roots of the weeds are cutted they wil stop growing. Comes with an 1400mm ash handle to save your back. The trowel is used by pulling it towards you. While pulling the planthole is made. The Hori Hori knife is original a Japanese design. Hori means to dig, and the knife is made to dig and to weed. The serrated blade is sharpened on both sides and the point is not too sharp. With the serrated edge you cut trough roots very easy. It is for transplanting, cutting roots and you can split your perennials as well. Made with a solid oval ash handgrip. The Hori Hori knife is original a Japanese design. Hori means to dig, and the knife is made to dig and to weed. The blade is sharpened on both sides and the point is not too sharp. It’s for transplanting, cutting roots and you can split your perennials as well. Made with a solid oval ash handgrip. A real warrior in the garden. Made from one piece of the best quality steel and it will help you to weed and cultivate your border, raised bed or container. It works like a Ninja, very effective. A real warrior in the garden. Made from one piece of the best quality steel and it will help you to weed and aerate your border, raised bed or container. It works like a Ninja, very effective. To dig plantholes and build flowerbeds and use it as a hoe. The blade has the shape from a trowel and can be digged into the dirt very easy. Made of Boron steel and comes with a 48cm long ash handgrip. A must for every vegetable gardener. The old school plow, used in the vegetable gardens decades ago, we make them again. Great to use as a plow in the dirt, but also great to make planting- and seedling rows in the vegetable garden. We do make a larger version too. The 48cm drop grip handle makes the tool perfect to work in raised borders and vegetable gardens. With the holes in the blade the dirt does not stick to the blade. The special cutting edge cuts through soil like clay easy. A fantastic tool to devide and transplant your annuals. The short handle gives you the benifit to sit and work. With the holes in the blade the dirt does not stick to the blade. A fantastic tool to devide and transplant your annuals. The long handle gives you the benifit to save yourback. With the holes in the blade the dirt does not stick to the blade. This push spork is a fantastic weeding tool. It cuts through clay, sand and gravel to loosening the roots of your weeds. With the holes in the blade the dirt does not stick to the blade. This pull spork can be used to loose the soil in the garden. Instead of pushing this hoe, you can pull it. The sharp cutting edge makes it easy to cut through the soil. With the holes in the blade the dirt does not stick to the blade. Every regular gardener that worked with a cultivator knows the problem when you see some weeds that you just can’t get loose with the tines of a cultivator. On top of this great tool we have made a blade that can be used to loose the weeds during cultivating. Just turn the tool and start weeding. It’s also available with drop grip and long handle. Every regular gardener that worked with a cultivator knows the problem when you see some weeds that you just can’t get loose with the tines of a cultivator. On top of this great tool we have made a blade that can be used to loose the weeds during cultivating. Just turn the tool and start weeding. The 48cm drop grip handle gives you more reach in your border. Every regular gardener that worked with a cultivator knows the problem when you see some weeds that you just can’t get loose with the tines of a cultivator. On top of this great tool we have made a blade that can be used to loose the weeds during cultivating. Just turn the tool and start weeding. The long handle is a real backsaver. Twisting the tines of the tool created maximum strength of this garden claw. In combination with our ‘Welldone’ connection you have the thoughest tool for your garden. The twisted tines are going trough your soil like a hot knife trough butter. With the 48cm drop grip handle you have a great reach in your border. This handfork can be used as a small rake. The tines are bended which is easier if you want to pull or leverage the mulch in your border. It’s made from the best Swedish Boron steel and it comes with an Ash drop-grip. It’s also available with an ash handgrip or a long 1400mm handle. This weeder has a small blade that allows you to weeds in small area’s where plants and flowers are planted close to eachother. The blade is pushed below surface and while you pull and push the weeder it’s loosening the soil and cuts the roots of the weeds. With the 48cm long drop grip handle you can reach more places in the border and raised beds. Small but strong garden knife, to weed on tiny spots in the garden. During one of our trip in Australia some people asked us to design tools for prospecting in the Australian gravel. Less weight, though, strong and durable. This pickaxe is one of the three designs we have made for them. Great for prospecting on the dirt, but also a fantastic tool when you need to change rough land into a nice garden. During one of our trip in Australia some people asked us to design tools for prospecting in the Australian gravel. Less weight, though, strong and durable. This scoop dog is a real scoop that is build to work in hard circumstances. It works like a heavy duty hoe to open the dirt, changing rough soil into a garden or planting beds. The Pipe and cable finder is used to search for any underground pipes and cables. The special head makes it easy to put it into the ground. This pipe and cable finder is provided with an isolated section. The fibreglass takes care of the situation that there is no conduction when hitting a power cable. Because of the special head and the small size, this tool is very easy to search any underground pipes and cables. This dandelion weeder, also called Cork-screw weeder, is ideal for removing tap-rooted weeds such as Dandelion. It is very simple to remove, you only need to screw the steel spiral into the lawn and pull out the intire root. This version comes with an 40cm ash T-handle. This dandelion weeder, also called Cork-screw weeder, is ideal for removing tap-rooted weeds such as Dandelion. It is very simple to remove, you only need to screw the steel spiral into the lawn and pull out the intire root. Comes with an 80cm ash T-handle to save your back. DeWit® pull and push hoes are recognizable by their blue color and oval logo. This logo is the warranty that you have a real hoe which is tapered. The tapered blade of the hoe is sharpen by itself when it’s used. DeWit® hoes are comming with an painted 1400mm ash-handle. The blade goes underneath the surface and by pushing the hoe, it will cut the roots of the weed. After this you can remove the weeds from your garden. DeWit® pointed hoes are traditional used by the farmers in the Northern part of Holland. The pointed edge cuts through clay very easy. Every unique feature of a DeWit® hoe is also appliceable on this DeWit® pointed hoe. It comes with an 1400mm ash handle. DeWit® heartshaped hoes are around applied with a very sharp cutting edge. You can use this hoe by pushing and pulling it, but also sideways. Every unique feature of a DeWit® hoe is also appliceable on this DeWit® heartshaped hoe. It comes with an 1400mm ash handle. The Westland hoe has a blade that is 25mm higher. For over 100 years these hoes are made in the Westland, since 60 years DeWit is making this type of hoe. Ofcourse every unique feature of a DeWit® hoe is appliceable on this Westland hoe. It comes with an 1400mm ash handle. This straight hoe, also called model Limburg and Venlo, has a blade which is forged and around provided by sharp edges. The smaller blade is suitable for hoeing in softer ground. Ofcourse every unique feature of a DeWit® hoe is appliceable on this Straight hoe. Comes with an 1400mm ash handle. DeWit® hoes are forged in our factory with the so called ‘Forging waltz.’ The conical shape of the blade is the guarantee that the blade stays sharp while you are using it. Many hoes are being recreated, except the quality. You recognize a DeWit® hoe by the oval logo. All our hoes are provided with this oval DeWit® logo. DeWit® hoes are available with painted 1400mm or 1700mm ash handles. The handles for the push and pull hoes are comming with an extra grip on the top. The other hoes are coming with straight handles. These painted hoes are also always provided with the oval DeWit® logo. Most of our hoes we make are available in the sizes 14, 16, 18, 20, 22 and 24cm. 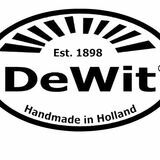 DeWit® tools are made since 1898 in the little village Kornhorn. Back in the days it was done with hammer and andvil, later with the forging hammers and now with the so called ‘Forging waltz.’ All our strengths of 100 years ago are the same with the hoes of today. Show you craftmanship by using the best tools in the world. And as an extra benifit, the job is done much faster when you are using DeWit® tools, good for you and the costumer. The Diamond hoe is fully sharpened and can be used for hoeing in the garden with large pieces of weed. While pushing you are cutting the roots of the weeds and with the sharp sides you can pull the weeds towards you. Every unique feature of a DeWit® hoe is also appliceable on this DeWit® heartshaped hoe. It comes with an 1400mm ash handle. This fairly new model of a hoe is commonly used by gardeners where the borders needs to be decent and flat. When using a normal push and pull hoe there are the so called ‘rills’ left behind. This half moon push hoe is made to leave the border decent and flat. Comes with an 1400mm ash handle. This push and pull hoe is also from a recently period. The round blade of this push and pull hoe is fully sharpened. When using a normal push and pull hoe there are the so called ‘rills’ left behind. This full moon push hoe is made to leave the border decent and flat. Comes with an 1400mThm ash handle. A local hoe which can’t be missed in our assortment. The half moon shape is an efficient blade that you can use in all different type of grounds. Sometimes the weeds are growing in your full flowerbed and you can’t find a right weeder because they are all to large. To remove weeds in your flowerbeds you pull and push this weeder under the surface to loosen the weeds. It’s nice and the small size gives you the benefits to weed without damaging your flowers and plants. Works great on tiny spaces in between plants and flowers. The 1400mm long ash handle is a real back saver. The DeWit® Swan neck hoe can be used to weed in the vegetable garden. It’s also a great tool for breaking the soil, when this is necesary. Available in different sizes from 12 to 24cm and it comes with an 1400mm ash handle. This beet hoe is perfect to weed in the vegetable garden. It’s also very easy to break the soil in the garden. Comes with an 1400mm ash handle. Made for typical old fashioned Dutch paving. Today it’s called blockpaving and the weed between the slabs have to be removed. The two sides have both their special edges that are helping you to remove the weeds. If you are not weeding the weed and moss will overtake the complete paved area. Comes with an ash handgrip to work on your knees. Made for typical old fashioned Dutch paving. Today it’s called blockpaving and the weed between the slabs have to be removed. The two sides have both their special edges that are helping you to remove the weeds. If you are not weeding the weed and moss will overtake the complete paved area. Comes with an 1400mm ash handle to save your back. This weeder has three different angles that fit in between paved areas. When weed comes between concrete tiles it’s hard to get them out. With the triangle head there is always an angle that scrapes the weeds out. Made with comfortable ash 750 or 1400mm handle. This Profi brick cleaner can be used to remove the weeds betweed paved areas. When weed comes between concrete tiles it’s hard to get them out. With this Profi brick cleaner you can remove the weeds very easy. The knife of this Profi brick cleaner can be replaced very easy, just loose the bolt and replace it. Comes with an 1400mm ash handle. DeWit® spades are forged out of one piece of Boron steel. The ash T-handle is processed inside the neck of the spade. This will increase the quality of our spades. This spade is created for digging and creating plantholes. The blade is tapered and is always sharp. Comes with an 750mm ash T-handle. DeWit® spades are forged out of one piece of Boron steel. The ash T-handle is processed inside the neck of the spade. This will increase the quality of our spades. This pointed spade is because of the pointed blade easy to dig in clay ground. Comes with an 750mm ash T-handle. DeWit® spades are forged out of one piece of Boron steel. The ash T-handle is processed inside the neck of the spade. This will increase the quality of our spades. This transplant spade is used for placing curbstones and are 60 and 100mm wide. They come with an 750mm ash T-handle. DeWit® spades are forged out of one piece of Boron steel. The ash T-handle is processed inside the neck of the spade. This will increase the quality of our spades. This spade has a special cutting edge that looks like a shark. Because of the sharp edges it is easy to dig in different type of ground. DeWit® spades are forged out of one piece of Boron steel. The ash T-handle is processed inside the neck of the spade. This will increase the quality of our spades. This Spork is a design with oval holes in the blade and the special cutting edge. Because of the oval holes in the blade, the clay and mud will not stick to the blade. The sharp edges makes it easy to dig in the different type of ground. DeWit® spades are forged out of one piece of Boron steel. The ash T-handle is processed inside the neck of the spade. This will increase the quality of our spades. This transplant spade is used for digging perennials and bushes. The V-cutting edge has more grip on the roots of the plant. This spade comes with an 750mm ash grip. DeWit® Drainage spade are created for the construction of drainage. On places where it isn’t possible to work with a crane, you can use this Drainage spade. With the blade of 60cm you can create a perfect ditch for the construction of drainage. It also can be used for the construction of different type of cables. This concrete shovel is a hardened version and comes with an 600 or 1100mm ash handle. There are many specialist who are bringing different types of shovels to the market, we do only have the basic version of the concrete shovel. The sand shovel is also an essential tool for your garden. This shovel can be used to fill your wheelbarrow, to dig and to fill the borders in the garden. The Dewit® shovels are comming with an 600mm or an 1100mm ash handle. Also available with steps to safe your shoes. It’s a sand scoop with our special cutting edge. The edges are very sharp and cut trough soil and roots very easy. The ash handle makes it a perfect tool to work in tight areas. Easy to dig large plant holes and perfect to use when you need to divide large plants. The large size of the blade makes it also a perfect scoop to fill your containers, wheelbarrow and large pots. Also available with steps or a 600mm ash handle. DeWit® Gardenforks are easy to use in the vegetable garden for turning the ground and to harvest different type of vegetables. The handgrip is heavy duty and made for the real worker. This DeWit® Gardenfork is a lighter version for working in the garden and vegetable garden. This version makes it to a perfect help, if you don’t want a heavy tool. The weight of the tool and the quality are perfect in balance. This easy to use Garden fork has three flat oval tines. A perfect tool to turn and cultivate the compost and for filling the wheel barrow with garden waste. This rosefork is created for gardeners who want to fertilize their plants directly to the roots. The flat tines are close to eachother and by putting it inside the ground near the roses, the fertilization can be putted in the holes. The roots of Thistles are long and deep and are difficult to remove from the garden. With this DeWit® Planting/weeding fork the most of the roots can be digged out and removed permanently. For big places with a lot of Thistles this DeWit® fork can be used. This professional thistle fork can be easy putted in the ground with your feet, because of the round tube. This is also working as leverage. This Lawn repair fork can be used to repair the lawn after slidings during a football game. This tool is developed in coöperation with Feyenoord. The length of the tines are made so the drainage beneath the lawn will not be damaged. This Ladies fork can be used for turning the ground and to harvest different types of vegetables. It’s also great for digging and aerating soil. This a lighter version, special made for ladies, for working in the garden for a long time. This professional Lawn care fork is provided with short tines. This professional Lawn care fork is provided with long tines. A great tool for weeding in the border and vegetable garden. The two tines makes it easy to remove big weeds and together with the long handle you can safe your back. Also available with a shorter 800mm handle with T-head. This lawnedger has a forged blade which can be used for cutting edges on your lawn. The blade is tapered and the edge is fully sharpened. Made out of Boron steel and comes with an 850mm ash T-handle what gives you the opportunity to easy guide the lawnedger. This lawnedger has a steel handle that’s very strong. The blade is forged and this lawnedger comes with steps to protect your shoes. The T-handle gives you the opportunity to guide the lawnedger. The blade of this lawnedger is not forged, but it is sharp as a razorblade. It comes with an 850mm ash T-handle what gives you the opportunity to easy guide the lawnedger. This lawn edging cutter can be used to cut the edges of the lawn. By pushing this lawn edging cutter the edges will be cutted very easy, because of the sharp knife. Comes with an 1400mm ash handle. Available in a right and left version. DeWit® Lawn rake has round tines which are a lot stronger then the most common flat tines. The round tines can endure more power so you can rake more leaves. This Lawn rake takes care of the repeating movement of raking. The second row tines takes what the first row has left behind. Most of the rakes you can buy in the shops are pressed metal. A DeWit® Builders rake is a real rake that is provided with forged tines. With this rake you can work on the construction site and as well in your garden. And this rake isn’t afraid for one rock more. DeWit® Seeding rake is an old-fashioned product which is very strong. The tines are forged piece by piece and that makes this rake to an essential piece in the garden. Easy to share with a group of gardeners if you need real quality. We create these rakes with round en square tines. The garden rake with 12 tines is a heavy tool with a total length of 150cm. It’s perfect for the gardener who wants just a little bit more then the quality of the construction market. DeWit® Bow tine rake X-treme with 1400mm ash handle. Because of the bow, the rake is more stable and more easy to use. The risk of improper use is less, because the bows are protecting the rake for bending. For working with hot Tarmac you can’t use a normal rake, because the handle will burn to soon. This Tarmac rake has a long piece of metal between rake and handle so the ash handle will not burn. With this handhoe-rake you can remove weeds from the garden. With the knife on the top of the rake, you can also rake the weeds out of the garden. Hoeing and raking is what this handhoe-rake does. Comes with an 140mm ash handgrip. We also make them with a longer handle to safe your back. The Hoe-rake is a Dutch invention of mr. Jordaan. Only raking wasn’t enough, he wanted to remove the weeds at the same time. He created a knife on the top of the rake and this is where the Hoe-rake was born. Hoeing and raking in the same movement. In the meantime we have different types of the Hoe-rake in our assortment. DeWit® pavinghammers are known for their good quality. We are making pavinghammers for more then 70 years in our factory. The different kind of hammers are various in sizes and the weight is also different from eachother. For this reason a road maker can use his own chosen pavinghammer. Besides machine paving there is a lot of paving work on the traditional way, for this craftmanship we are making these hammers. DeWit® pavinghammer model Staphorst is made in two sizes. For basic material we are using 25mm square, which means we have to forge to get the jaw to the right size. Because of the lighter basic material, the weight is less then the normal versions. These hammers are made with an oval ash handle. Road makers are well-known of the loosen handle of the pavinghammer. The fibreglass handle is a solution for this problem, as long as the handle is used where it is made for it will always stick. Fibreglass handles which are used to hit the road will loose and is not covered by the warranty. DeWit® pavinghammers with nylon head are most of time used at ornamental pavement. They are made in 50 and 70mm jaw wide. The nylon head is also seperately available. DeWit® pavinghammers with nylon head are most of the time used at ornamental pavement. They are made in 50 and 70mm jaw wide. The nylon head is also seperately available. In combination with the fibreglass handle this is the most professional hammer we can make. Gummi head suitable for DeWit® pavinghammers. Placing curbstones is common done by crane but also in coöperation with two professionals. The workers are lifting the curbstone together and placing them on the sand. The curbstone lifter small short is the best sold curbstone lifter we have in our assortment. For the more wider curbstones we have this Curbstone lifter with larger jaw. This R.W.S. curbstone lifter is used for placing special driveway blocks. The wide and high jaw has a turned end which can be placed beneath the blocks, so it can be lift up easy to put it on the right place. The double hinge on this curbstone lifter ensures better control of power transfer, so you need less power for lifting a curbstone. In the end you have better control on the curbstone for placing it. This curbstone lifter with replaceable heads gives you better control on slippery curbstones. These lifters are made out of oval tubes that saves a lot of weight. Sometimes it is needed to do the paving work again or there is a brick that needs to be removed for placing temporary signage. With this DeWit® Brickpuller is that finished very fast. The knifes are replaceable and the brickpuller is galvanized so you can work with it for a very long time. The handles are glued to the metal. Placing curbstones is common done by crane but also in coöperation with two professionals. The workers are lifting the curbstone together and placing them on the sand. This curbstone lifter is longer then the normal version, so there can be worked with a straighter back. This curbstone lifter with diamond points is made for extra grip on slippery curbstones. The small points are replaceable and can turned on by screw thread. These lifters are made out of oval tubes that saves a lot of weight. Paving is more and more done by machinery. Because of that sometimes the bricks are not in a straight line. To fix this we’ve created the Block spacer. The block spacer comes with a hardened knife which you can put between the bricks to improve the straight line. For the smaller jobs you need a little help. This adjustable brickcarrier can sometimes be the solution. There is not always space for using machinery brickcutters, sometimes you are working in small places where you can’t use larger machines. This small brick cutter is the perfect solution. You can use this rammer wood for ramming tiles. After you hit the tile the wooden head if this rammer will not spring back. The original DeWit® rammer nylon. After our patent many times recreated by other companies, but the real power en strengtness is never the same as ours. With it’s large three kilograms an indispensable tool for the road worker. The nylon head will give you a resilient effect. Tamping the ground for paving is mostly done with a vibration plate. Sometimes the space is too small and you need this rammer with wooden block. It’s also great for hitting the curbstone after you placed it. Also available with a shockfree handle to intercept the hard kick on your wrist. This version is made with an replaceable wooden block. Tamping the ground for paving is mostly done with a vibration plate. Sometimes the space is too small and you need this rammer. It’s also great for hitting the curbstone after you placed it. Also available with a shockfree handle to intercept the hard kick on your wrist. The rammer steel can last longer then the rammer with wooden block. If the rammer can’t leave any scratches or other damages behind, then you need this rammer with rubber feet. The format of 30 x 15cm is great for tile pavement. This rammer has an schockfree head so you can intercept the hard kick on your wrist. This punner has a 110x110mm square feet for professional use. The long length makes it more easier to tamp holes in the ground. This punner has a 110mm round feet for professional use. The long length makes it more easier to tamp holes in the ground. This punner with fibreglass handle reduces the annoying vibrations in your hands while hitting, it also provides a better grip. The lifetime value of this punner with fibreglass handle is also very long. Available in a 3500gr head and 7000gr head. This manhole hook is made out of one piece of Boron steel and the point is forged and hardened by experts. This curbstone hook is made out of one piece of Boron steel and the head is forged and hardened by experts. The head of this manhole hook can be placed beneath a curbstone to lift it up. It’s also a great tool for placing the curbstone if there is no space for the curbstone lifter. This manhole hook is made out of one piece of Boron steel and bended head with point is forged and hardened by experts. These DeWit® road fencing pens are provided with forged and hardened points. Because of the extra proces of forging, the price is rising, but on the other hand you can use it much longer. Also in the world of infrastructur durability is becoming more important, we achieve this with our quality. A DeWit® road fencing pen can be used for many years. This road fencing pen is provided with a forged point, but also with a bended square head with a circle to apply your wire. DeWit® road fencing pens can be used for many years. A basic version of heavier material. The 14mm round piece of metal is provided with a forged and hardened point. Bending this road fencing pen is difficult because of the thicker material. DeWit® has more then 70 years experience with pinchbars and you can feel te difference. The weak spots of the competition is the weld. The weld we are using is stronger then the material itself, so it will never break. The chisel of the DeWit® Pinchbar are forged and hardened by professionals and the weld is completely done by the robot. The original DeWit® pinchbars are recognizable to our logo in the head of the pinchbar. These DeWit® Pinchbars are made out of one piece of Boron steel. The pinchbars are provided with round knobs and the pointed chisel is forged and hardened. Quality for the craftsman, made in Holland. Made ouf of one piece of Boron steel and the chisel is forged and hardened. The D-handles makes it easy to lift this Pinchbar up. Quality for the craftsman, made in Holland. Pinchbar with nylon head. The chisel is forged and hardened and at the top the pinchbar is provided with a replaceable nylon head. Because of this nylon head it can also be used as a rammer and the curbstone or pavement will not be damaged. The curved chisel of this pinchbar is made for lifting beams and for example road plates. Provided with a round knob and the chisel is forged and hardened by professionals. DeWit® Rootcutter comes with a round knob and an extra wide forged flat chisel. The wide chisel can be used perfectly for scraping rust. With this Dewit® Tree-rootcutter, which is provided with a round knob and an extra wide forged flat chisel, it is easy to cut through roots. The thin chisel in together with its wide and the total weight, makes this the perfect tree-rootcutter. Attention: you can’t use this tree-rootcutter horizontal, because there is a possibility the blade will break. Carefully using this tool is important, it’s not a pinchbar or crowbar. The rootcutter is provided with a forged curved head. Perfect for makeing round planting holes into hard soil or grind. If the ground is too hard to use the posthole drill, you can make a beginning with this tool. Forged out of one piece, comes with a round knob and hardened head. Pinchbar with fibreglass handle is made for their insulating effect. When you need to work in the ground and you don’t know if there are any electricity cables, this pinchbar is the one you need. The fibreglass will protect you until 10.000 Volts. DeWit® pinchbars with square heads are provided with round knobs and are welded by robot. The square head of this pinchbar is forged and hardened. The weld of a DeWit® pinchbar is stronger then the original material. For professionals on the construction site, tools are very important to work on a safe way. A worker shouldn’t safe money on safety. DeWit® for and from professionals. The original crowbar as we make them since the 60’s. Suitable for the heavy demolition work. At the top a forged and hardened chisel and at the bottom a forged and hardened crowbar. The crowbar is used for pulling nails and other demolition work. The original crowbar as we make them since the 60’s. Suitable for the heavy demolition work. At the top a forged and hardened chisel and at the bottom a forged and hardened crowbar with curved end. The crowbar can be used for pulling nails and other demolition work. The original crowbar as we make them since the 60’s. Suitable for heavy demolition work. At the top a round knob and at the bottom a forged and hardened crowbar. The crowbar is used for pulling nails and other demolition work. The DeWit® Crowbar on wheels is used for moving heavy loads for example freezers, coolers, safes and other machinery. This crowbar is provided with metal wheels and can lift loads until approximately 2,5 tons. Made in Holland. Perfect for small demolition work. Comes with a small forged chisel and on the other side a bended nail puller. Assembly bar with forged chisel and forged round point. Heavy duty planting bar, with just 2ft length they are easy to handle and the solid bar gives them the weight you need when working in dry, hard or rockery soil.With these bars you can dig on any place at our planet. Made with a forged round blade. Dig it with the planting bars from DeWit®. Heavy duty planting bar, with just 2ft length they are easy to handle and the solid bar gives them the weight you need when working in dry, hard or rockery soil.With these bars you can dig on any place at our planet. Made with a forged pointed head. Dig it with the planting bars from DeWit®. Heavy duty planting bar, with just 2ft length they are easy to handle and the solid bar gives them the weight you need when working in dry, hard or rockery soil.With these bars you can dig on any place at our planet. Made with a forged chisel. Dig it with the planting bars from DeWit®. These adjustable posthole drills are forged by hand and are available in the diameter sizes of 4 to 20cm. The T-handle is provided with black handles for comfortability. There are extension pieces available for these posthole drills. The adjustments for drills can fitted on all our standard adjustable posthole drills. Made out of Boron steel and forged for the farmer and other workers. The by hand forged point on this posthole drill will go in the ground very easy and can’t be replaced by any other posthole drill. DeWit® Posthole drills are being made in Holland and that’s the warrantee for durability and quality. We also make the Posthole drill professional, this type is provided with a forged point and aren’t adjustable. They are available in the diameter sizes of 6 to 15cm. The T-handle is provided with black handles for comfortability. Made out of Boron steel and forged for the farmer and other workers. The by hand forged point on this posthole drill will go in the ground very easy and can’t be replaced by any other posthole drill. This galvanized version is made in Holland which is the warrantee for durability and quality. With this Potato planter you can plant seed potatoes with the same distance. Because of the long handle, you can work while you are standing. This will definately save your back. Made out of the best Boron steel and made for the real gardener. This DeWit® Posthole lifter is not made for the farmers only. This posthole lifter works also perfectly for people who are working in the infrastructure and need to move for example traffic lights. It’s very easy to lift something up with a straight back. Wooden poles, square concrete fence or road marking poles it doesn’t matter! With this DeWit® Posthole lifter you will lift what you want. This is an original design of DeWit®. This product is designed to fullfill two functions. At one side you can find a hook for easy opening the manhole. At the other side you can find a shovel for cleaning the dirt out of the manhole. Easy to use and made out of Boron steel. A long gouge to get a sample out of the ground to investigate. This Ground sample drill is 60cm long and can be pushed into the ground. After you pulled it out of the ground you can investigate the type of ground. The Heavy duty posthole lifter is made for professional use. In some of the situaties you need to move poles, this is the solution. The hinged eye comes around the pole and the pole can be pulled up by means of a lever action. When placing fencing and garden posts, tamping is sometimes necessary. You can do that with a hammer with the risc you are damaging the top of the posts. This Posthole digger goes around the pole to keep the top in good condition. With the heavy weight the pole can be pushed into the ground easy. Provided with two comfortable handles and available in two sizes. Sometimes a posthole drill isn’t the right tool to create holes into the ground, because the soil is too hard or too soft. Then you need this posthole digger, which in fact is a double shovel with a hinge. De long handles makes it perfect to dig deeper holes into the ground. The DeWit® Lobster claw is used for loosening soil so the top layer of the ground receives more air. Made for working between the plants in the vegetable garden. Provided with an 140mm ash handgrip. The DeWit® Lobster claw is used for loosening soil so the top layer of the ground receives more air. Made for working between the plants in the vegetable garden. Provided with a long metal handle to save your back. DeWit® Stick to secure your sheep, goat, calf or dog. Available in different sizes. An easy tool for moving trees. The sharpened points gives you extra grip. Also available in a longer version. An easy tool for moving trees. The sharpened points gives you extra grip. The longer handle saves your back. DeWit® Lifting hook round pointed can be used for moving trees and heavy braches. The iron handle is really comfortable. Very strong, fully sharpened and made out of Boron steel. Made in Holland. Very strong, fully sharpened and provided with a leather handle for extra grip. This pick axe can be used for different purposes like loosening hard soil types. At one side a sharp point and the other side wider chisel. Comes with an 950mm ash handle. The DeWit® Forestry hoe straight can be used to cut down trees. It comes with a 1050mm straight handle. The DeWit® Forestry hoe round can be used to cut down trees. It comes with a 1050mm straight handle. Moving, turning and pulling trees straight up is an easy job with the so called ‘Sappy.’ This product is available with a 380mm, 800mm or 900mm handle. For splitting trees you can use this DeWit® Super splitting axe. This DeWit® Splitting hammer can be used for splitting trees. The other side of the Splitting hammer can be used for hitting a splitting wedge into the wood. Small DeWit® Garden axe for cutting branches and small trees. Comes with an 360mm ash handle. DeWit® Carpenter’s axe is designed for carpentry and other woodwork. The axe is provided with a sharp and straight cutting edge and can be used as axe and hammer. This Cerpenter’s axe has also a claw for pulling nails. Comes with an 400mm ash handle. DeWit® Splitting wedges can be used for splitting hardwood that is needed for your fireplace. DeWit® Splitting wedges can be used for splitting hardwood that is needed for your fireplace. The nylon head is intercepting the hard slap between the metals. This will reduce the vibrations in your hands, while you are hitting the splitting wedge. For the more lighter work this Hand axe is the perfect solution. Can be used for firewood and garden work, but also a great tool for cutting small and thin branches. This DeWit® Forest axe is a great tool for cutting down trees that is needed for the fireplace. Cutting small trees can be done very easy with this axe. The DeWit® Splitting axe is made for splitting trees for your fireplace. Available in 1100gr with a 600mm handle or 2000gr with a 800mm handle. The DeWit® Ditchcleaner can be used for cleaning the ditch. Comes with a ring, but without a handle. The DeWit® Pondcleaner is used for dreding a ditch or pond. Comes with a ring, but without a handle. If you want to clean up your ditch, this DeWit® Ditchcleaner will help you. Available in a version with 6 tines and a version with 8 tines. Comes with a ring, but without a handle. This Paper picker is provided with a sharp and forged point which can be used for picking up paper and other waste. Comes with an 750mm ash handle. Sharp as a razorblade and made out of Boron steel. Comes with an 140mm ash handle. We are making this Straw hook in a left and right version and it can be used for loading straw on a wagon. With a fast waving move you can put the straw on the wagon. Made out of Boron steel and the point is sharpened. For cleaning up your ditch. Comes with a ring, but without a handle. For cleaning the barn. Delivered without a handle. This DeWit® Straw hook is fully made out of Boron steel and comes with an iron handle. The point is hardened so you can use it for many years. For cutting hard materials like beets. Fully sharpened and provided with an ash handgrip. To harvest Asparagus, you need strong tools. This DeWit® Asparagus knife is the tool you need for the job. The sharp jaw at the bottom and the strong Boron steel makes this the perfect tool. Comes with an 140mm ash handle. DeWit® Floor / wall scraper with ash handgrip. Great for scraping for example ice on your paving. DeWit® Floor / wall scraper with ash T-handle 800mm. Great for scraping for example ice on your paving. This DeWit® Drainage scoop is suitable for flattening slots for drainage. Delivered without a handle. Gummi head for DeWit® Curbstone lifter article number 0105. Knife for DeWit® Brickpuller article number 0108. Wooden block for DeWit® Rammer with wooden block article number 0401 and 0511. Knife for DeWit® Block spacer article number 0118. Replacement head for DeWit® Rammer wood article number 0201. Original wedge to fix a pavinghammer handle. Turning head for DeWit® Posthole drill adjustable articlenumbers 4004 t/m 4020. Knife for DeWit® Profi brick cleaner article number 9895 or 9897. Diamond point for DeWit® Curbstone lifter with diamond points article number 0114. Nylon head for DeWit® Pinchbar with nylon head article number 7015. Spring for DeWit® Posthole drill adjustable article numbers 4004 t/m 4020. Nylon head for DeWit® Pavinghammers with nylon head article number 0026, 0027, 0028, 0029. Gummi head for DeWit® Pavinghammers. DeWit® Gift set art. 3000, 3004, 3051 in carton box. Set of tools on a heartshaped hanger. This set consists of the 3 tine cultivator (3051), our forged planting trowel (3000) and for weeding the right handed Cape cod weeder (3097). The sets are available in sealed packaging or a small carton box. DeWit® Tool rack to hang up your favorite garden tools with an 140mm Ash handle. Steel for DeWit® Posthole digger article number 4400. Handle for DeWit® Pavinghammer oval Ash handle. DeWit® Display one Display with fifteen planting trowels and fifteen cultivators. The planting trowels are forged and comming with ash handgrips. These DeWit® Planting trowels are unique at their finishing. The blade is sharp as a razorblade so you can work with less effort. At normal use we give lifetime guarantee. The cultivators have three sharp tines so you can use it very easy. With this tool you can cultivate and aerate the border, so your plants get more energy to grow. The display and the DeWit® Gardentools are both produced in Holland. This display is more than just a rack in a garden center, it can be a good addition to lifestyle and health stores. DeWit® Display five Black or white display with twenty planting trowels and twenty cultivators. The planting trowels are forged and comming with ash handgrips. These DeWit® Planting trowels are unique at their finishing. The blade is sharp as a razorblade so you can work with less effort. At normal use we give lifetime guarantee. The cultivators have three sharp tines so you can use it very easy. With this tool you can cultivate and aerate the border, so your plants get more energy to grow. The display and the DeWit® Gardentools are both produced in Holland. This display is more than just a rack in a garden center, it can be a good addition to lifestyle and health stores. D6666 - Full concept display With this display you score completely at everything and everyone who has something with the garden. With this you can make the hobby gardener happy, but also the professional gardeners. Every tool that is really usefull in the world of gardening is on this display. The display is made for garden centres where the selling people are close to their customers. You can’t sell this on a normal display in the shop. These tools needs to be presented and to ensure a happy customer so that they come back again, it’s no problem to take some time for them. Because of the interaction between customer and seller they are leaving the shop happy and mouth-tomouth advertising will do it’s work. Ofcourse there are customers in the shop who are starting to talk about the price. These DeWit® Gardentools always deserves the best price when it comes to the competition and quality. It’s a good investment for the rest of your life. And after a few months the customer has forgotten the price, but because of the good quality you will always be in their memory. Quality is the best guarantee for every repeat purchase. When purchasing a Full Rack, we will be happy to contact you to discuss the contents and give a complete explanation of each product.